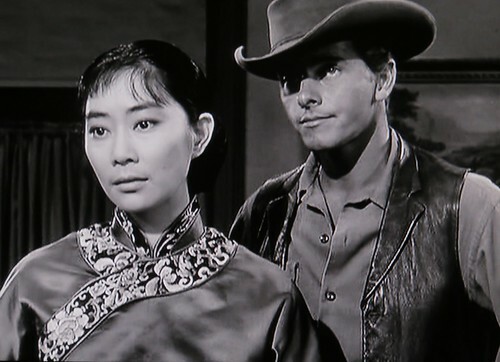 When I first began exploring the subject of Asian actors guest-starring in American TV westerns back in January 2012, the first such episode I watched that featured Lisa Lu was “Pocketful of Stars,” an episode of “Cheyenne” that first aired on November 12, 1962. 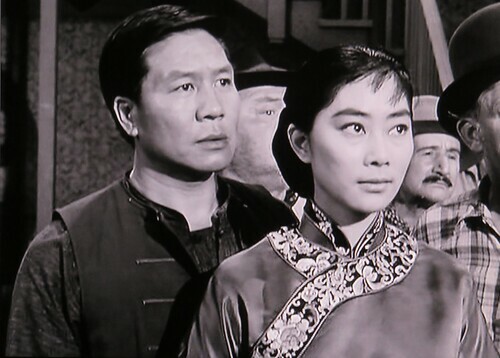 I’ve since seen her in a number of other TV episodes and have written about her here in three previous entries: Asian-American Stars on TV: Lisa Lu in “Bat Masterson,” “Hong Kong” and “Coronado 9” Asian Stars in TV Westerns, Part 1: Lisa Lu in “Bonanza” and THE MOUNTAIN ROAD and CHINA DOLL: Rare Hollywood Films about the War in China. 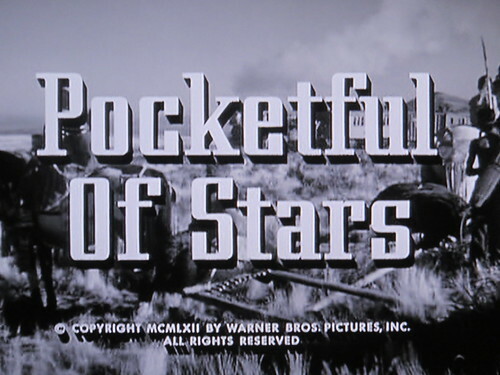 When “Pocketful of Stars” re-aired on the Encore Western Channel last week, I re-watched it and took some screen shots so I could do a piece on it here. 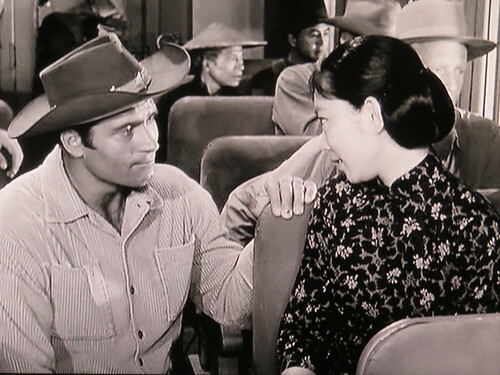 When the episode begins, Cheyenne is working as a scout for the railroad and his main job to negotiate with the Indians whose land the tracks will be passing. 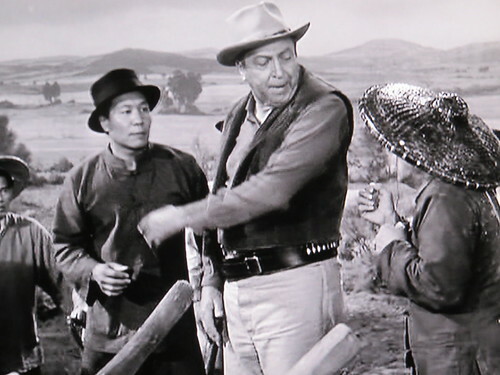 When the short-tempered railroad foreman discovers a woman and her aged father among the Chinese laborers he throws a fit and fires them, browbeating the Chinese crew leader who’d hired them and causing enough of a commotion to provoke Cheyenne into intervening to prevent physical abuse of the workers. 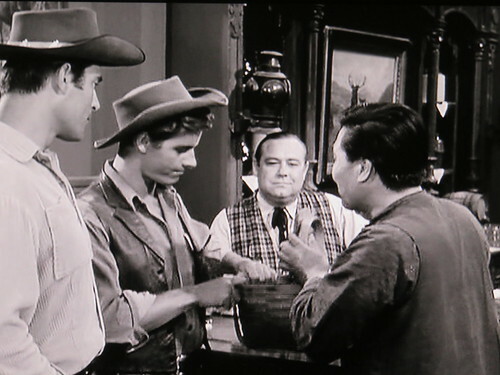 The contrivance is poured on thick in the next scene as the crew leader, Wang (Weaver Lee), is seen in town in the saloon selling lottery tickets in order to gain enough money to pay off the debt owed to Wang and send the woman’s father back to their home in San Francisco. The lottery prize is a “great pearl.” Having been suckered into buying a ticket, Cheyenne returns at night to witness the lottery drawing and is surprised to find that he holds the winning ticket. 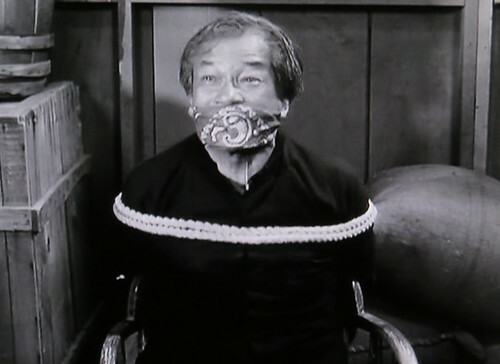 He’s even more stunned to learn that the “great pearl” awarded to the winner is none other than Mei Ling (Lisa Lu) herself, the Chinese woman fired from the crew. 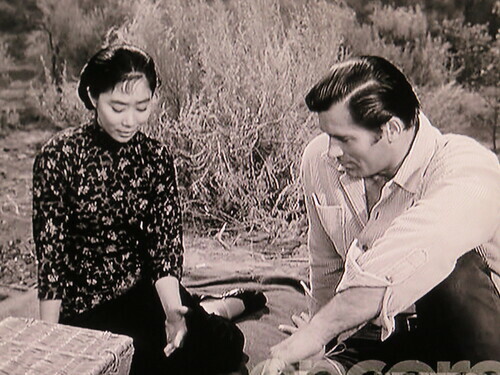 He rejects the offer and urges Mei Ling to go back to San Francisco with her father. He’s very nice about it, making clear he is not rejecting her per se, but simply the idea of owning another human being. 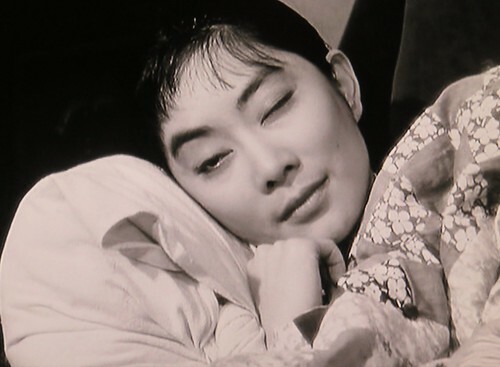 Mei Ling is persistent, however, and goes to Cheyenne’s hotel room and is eventually allowed to stay. She makes it clear that she’s willing to earn her keep by working and cooking for them. 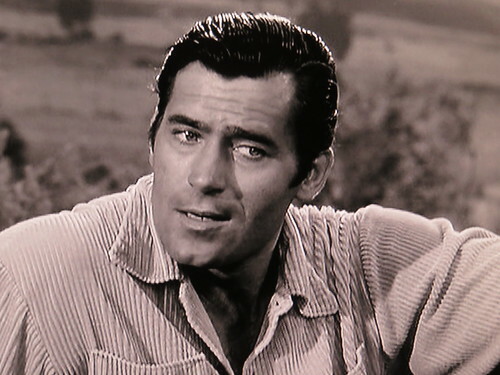 (Cheyenne’s sidekick, railroad surveyor Ross Andrews, played by Peter Brown, is instrumental in persuading Cheyenne to let her stay.) 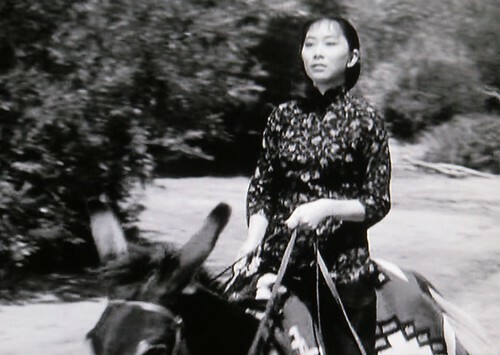 In the morning Cheyenne and Ross leave the room to go off on their railroad work while Mei Ling is sleeping, but she soon shows up on a mule in hot pursuit and they let her join them. 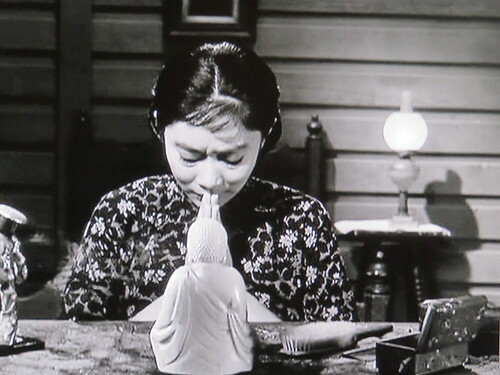 Mei Ling is pretty obsequious throughout, constantly referring to Cheyenne as “my lord and master,” which disturbs Cheyenne no end. 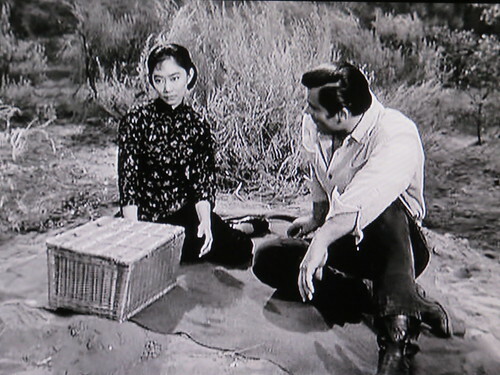 But it soon becomes very clear that the lottery was not an attempt to “sell” Mei Ling but to place her under the protection of the one man the Chinese could trust, since it was rigged by Wang to make Cheyenne win. 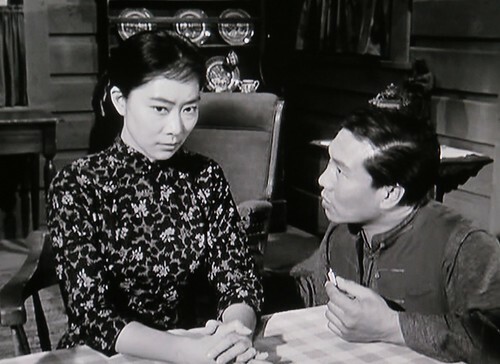 And, as in “Day of the Dragon,” Ms. Lu’s character’s subservience can be seen as part of an act, subtly manipulating the white hero to get what she wants. 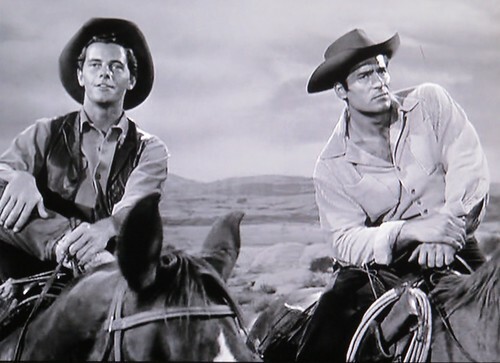 Eventually, the plot kicks in and complicates things as the corrupt white foreman (Robert Foulk) and his partner in town, the owner of a freighting business, conspire to take Cheyenne out of the picture since his efforts to keep the railroad tracks out of Indian land will interfere with their scheme to profit from the path of the railroad. 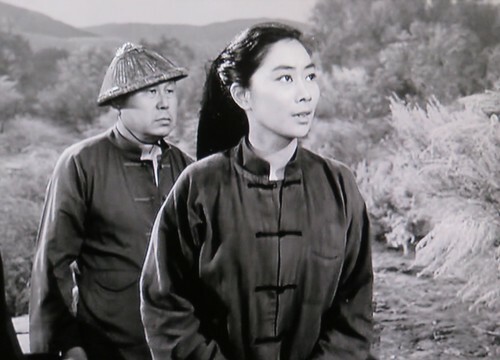 In a melodramatic twist, Foulk abducts Mei Ling’s father (H.T. 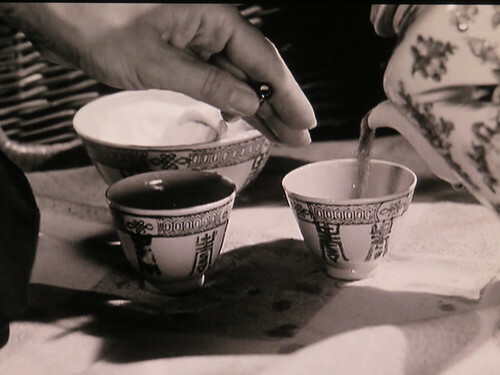 Tsiang) and orders Wang to give a vial of rat poison to Mei Ling and persuade her to put it in Cheyenne’s tea and poison him or her father will be killed. 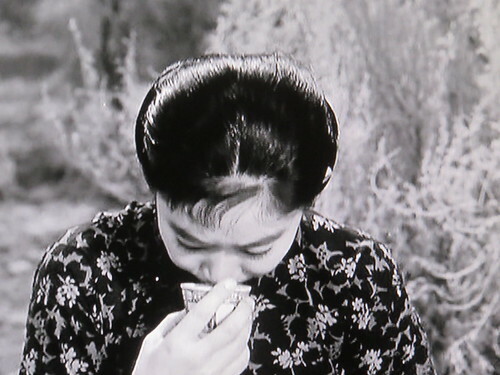 This sets off a crisis of conscience in Mei Ling and on the appointed day, she sits for lunch with Cheyenne in the field and has a long conversation with him about fate, choice and destiny before she surreptitiously empties the vial into a cup of tea—her own! Yes, it’s a contrived scene and it begs the question of why she didn’t simply ask Cheyenne for help since he’s already stood up to this foreman and shown himself more than capable of handling himself. 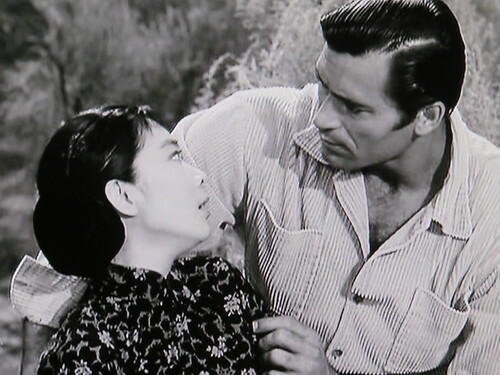 Self-sacrifice seems a bit extreme in this situation, but it gives Ms. Lu and Clint Walker an excellent dramatic dialogue sequence and a chance for Lu to break free from stereotype and express herself in clearcut sentences completely devoid of the pidgin English often given to Chinese characters in westerns (and quite evident in “Day of the Dragon”). 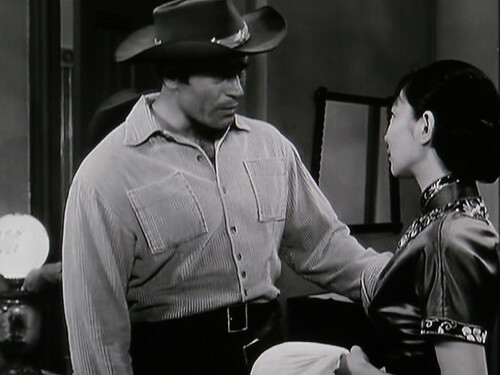 It also allows Cheyenne’s character to display his innate tenderness and show why he’s so trusted by the Chinese and Indian characters in the episode. 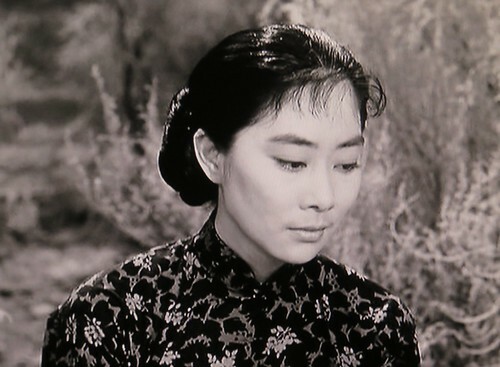 Mei Ling: Each minute, each second, parting is coming closer. Words are worthless because they cannot change that. Cheyenne: Mei Ling, you quit worrying. We’ll find a way to get that debt paid and then you’ll be free. Free to live the kind of life you want to. 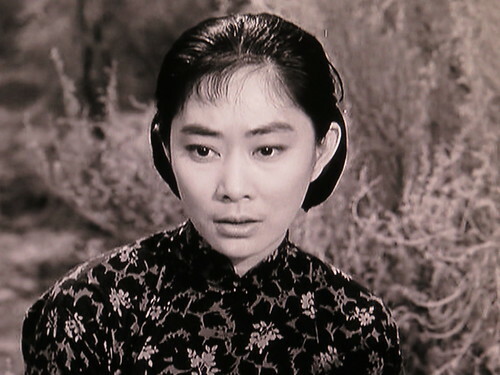 Mei Ling: Is anyone really free, Mr. Bodie? What we are, what we will be, where we are going. Our destiny is written in the stars. It is well that we do not know what’s written there for us. Cheyenne: Mei Ling, there’s a million stars up there. You pick the ones you like. Pick a whole pocketful of them. 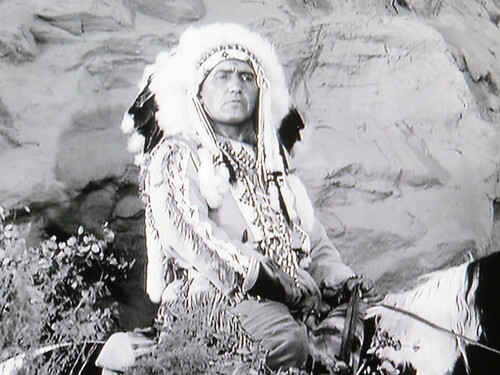 In any event, Cheyenne manages to get her to a doctor in time to save her and then he must pursue Foulk and his crew to the sacred Indian burial ground that Foulk plans to blow up to make way for the railroad, despite Cheyenne’s promise to Chief Red Knife (Frank DeKova) to stay clear of it. 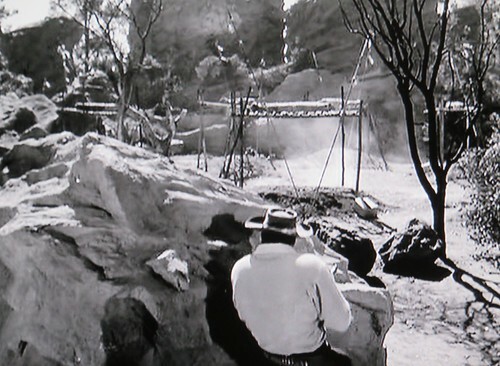 This leads to the one big action scene in the episode as Cheyenne and Ross shoot it out with the bad guys, to try and stop them from planting dynamite, culminating in a set of explosions. 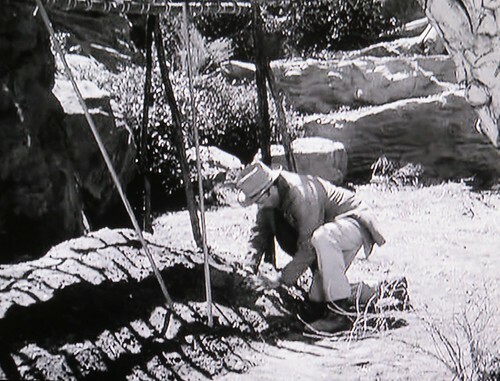 Red Knife shows up and is mighty peeved, but Cheyenne assures him the railroad won’t go near there. 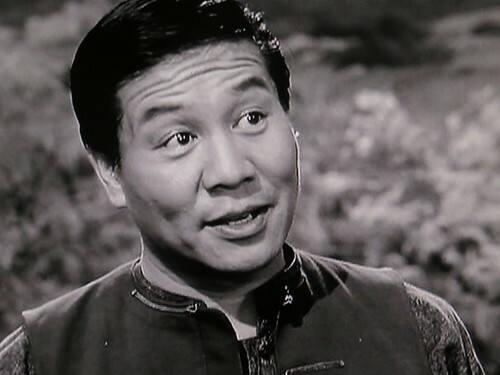 Cheyenne eventually puts Mei Ling and her father on the train to San Francisco and Wang goes back to supervising the Chinese laborers—and coming up with bogus lotteries. 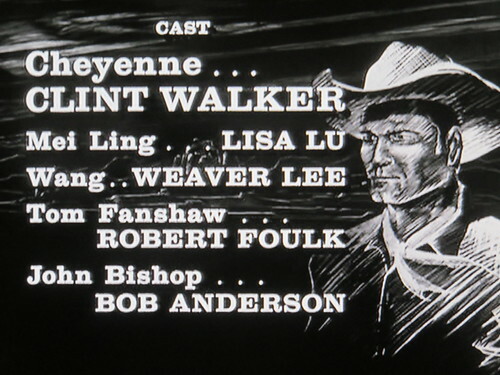 Interestingly, Lu and Walker were born four months apart in 1927 (she on January 19, he on May 30). As of this writing, both are happily still with us. Peter Brown was born October 5, 1935 and will turn 80 in a couple of weeks. 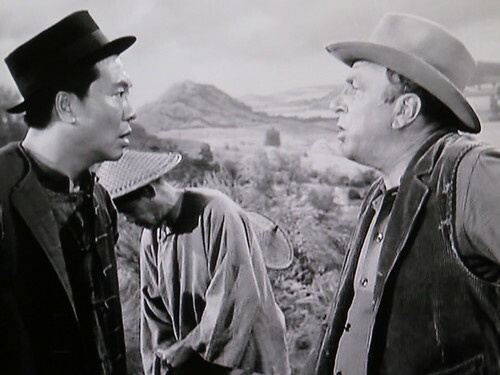 Slim Sherman and Jess Harper rescue a troupe of Japanese entertainers on their way east when their wagon breaks down near the ranch. Following the wagon closely are a trio of outlaws that believe the troupe is carrying a fortune in opium and they want it. The only thing that they carry is one small boy named Mike Williams who they’d found unconscious on the side of the road. 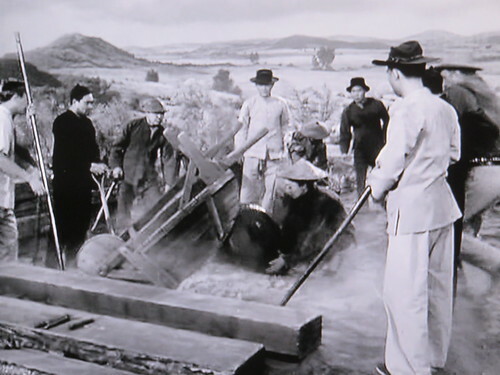 Due to the broken axle on the wagon they are forced lay over at Sherman Ranch to make repairs and give Slim and Jess a lesson in Japanese culture, though it leaves Jess a little bruised….